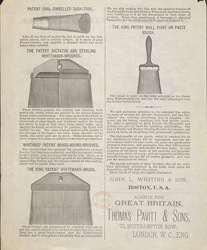 This is an advertisement for John L Whiting and Son’s, paint brush manufacturers. The Victorians were very proud of their homes and the middle and upper classes spent considerable amounts decorating and furnishing them. This was partly to make them more comfortable and partly to demonstrate their prosperity to their friends and neighbours. In the mid 1800s bright colours like crimson and magenta had been painted on walls in dinning and living rooms. These colours were viewed by candle light and were very striking. However with the introduction of gas lighting these colours looked gaudy and tasteless and more muted colours like stone and slate became fashionable.